With the 2018 mid term elections almost here, lets see where California stands so we can make choices that reflect reality and support our people. 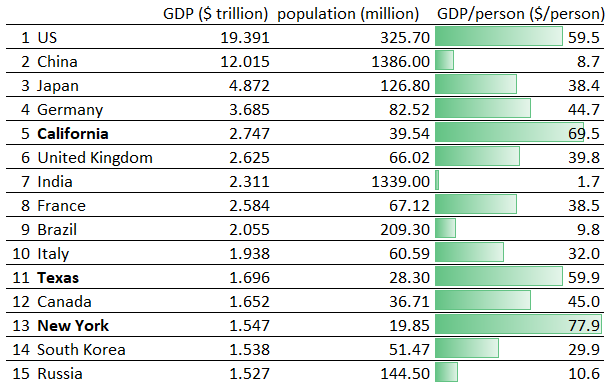 California is THE largest non-country economy on the planet. It’s a massive $1 trillion dollars ahead of Texas or New York. Put against other states, that’s a ho-hum position of #14. Behind Texas, Kansas, Nevada, New York and many others. You obviously want to borrow to invest in your future just not too much. We’re at a healthy place and can stretch more if our citizen are in need. California’s 2018 budget has a surplus of $9 billion. Governor Jerry Brown, a fiscal conservative, has done a great job in this department taking us from a deficit of $29B in 2011 to a surplus of $9B in 2018. Mexican’s aren’t taking over. I live in San Diego, the border being just 30 minutes away. Every week, thousands of Mexicans legally commute to the US and hundred of American commute from Mexico (“border commuters”). Sure borders need to be secured for illegal activities (smuggling, human trafficking, terrorist activities etc) but it’s not like “drug dealers, criminals and rapists” are pouring in the way Donald Trump would like his white mid-west voters to believe and get riled up. Our kids live here and we love them just as much as you love your kids. If this was an issue, we’d be on top of it. Trust your fellow citizens instead of politicians. Politicians gain votes if you’re angry with the opposition over phantom issues. Most Mexicans I’ve encountered in Southern California are hard working and productive. Just like others in California and the US. Like anything or anyone, we have our challenges. It makes sense to invest or otherwise address these. Unsustainable housing: This is a very real issue. With insufficient housing supplies, families compete against each other, driving prices sky high. Those who can’t even afford are obviously unhappy but every those whose bids get accepted are unhappy about the crazy mortgages. Nobody is happy about this. You should not have to be a lawyer/engineer/banker/executive just to afford a regular house. This isn’t healthy for the economy nor for society. Healthcare: Unless you’re wealthy, healthcare does not exist. As an example, when my son broke his arm this year, our total bill was around $5000 (five thousand)! I was fortunate we had great insurance and are in a better position but the average Californian cannot afford a doctor’s visit. When they can, the stress of the financial impact hurts mental health. High taxes: Californians are charitable and pay a TON of taxes. But know that any amount given to our fellow citizens as taxes, directly takes away from our family. In an ideal world, families would fund every public cause and project. But the reality is, with high living and housing costs, families and individuals need to be stronger from within before they can afford to spend on others (in the form of taxes). Spend efficiently and defund less critical projects. Income inequality: While the state as a whole has been growing, huge chunks of our population are poor. No civilized society should have such levels of disparity. As a capitalist, I realize that the rules of society with finite resources create a delicate balance point. That balance needs a correction where we still reward the innovative and hard working folks – but not by trampling on the less fortunate. Education: California’s innovation engines are powered by brilliant, motivated students coming out of the public school systems. From Kindergarteners to PhDs from the UC system – it’s one heck of a system. So why just alright? Because the best public schools are located mostly in wealthy neighborhoods, where housing is really expensive. To me, education is a fundamental right that must be accessible to all. I know we can do better. We must continue to invest here. That’s all folks. Those are the broad strokes – you decide how to vote and fill the details to drive us forward. Now stop reading – get out and VOTE 🙂 !